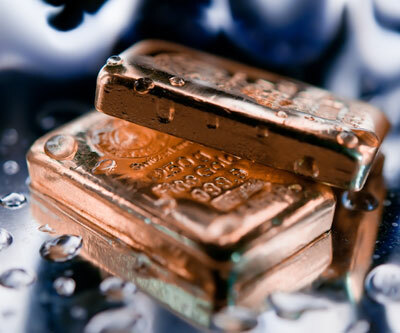 Gold futures for April delivery – the most active contract – settled at $1,300.50 an ounce on Thursday. It was the first time the metal traded above $1,300 since early November and gains for 2014 now top 8%. The price of gold slid 28% in 2013 – the worst annual performance since 1980 – on the back of mass liquidation of gold-backed ETFs. Last year the world's physical gold trusts experienced net redemptions of more than 800 tonnes collectively and suffered depreciation of close to $80 billion. Along with the stronger gold price, the first signs of a reversal of what had become a one-way bet is now visible. 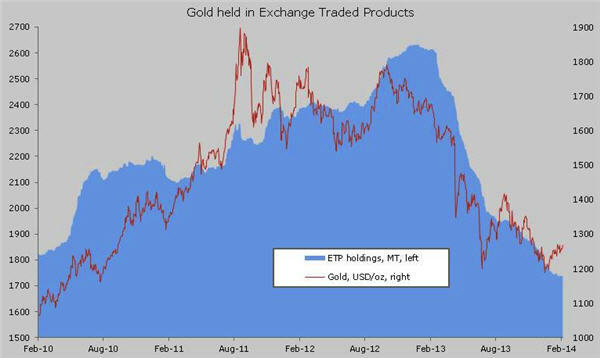 Holdings of SPDR Gold Shares (NYSEARCA: GLD) – the world’s largest gold ETF by a wide margin – on Thursday shot up the most since October 2012. That compares to just over 9 tonnes of inflows on October 4, 2012 when gold was trading just under $1,800 an ounce. GLD recorded only 17 days of inflows all of last year and almost 540 tonnes left the fund in 2013 from a peak of more than 1,350 tonnes.